Mayor rejects City Hall's support for LGBTQ athletes. At City Hall at noon on Friday, there was a flag-raising ceremony to mark the opening of the Olympic Games. The flag that was raised? The rainbow Pride flag, to honour LGBTQ athletes and show support for inclusive principles, as the Sochi Olympics opens amid opposition to Russia’s recently passed anti-gay legislation. Soon thereafter Rob Ford did his best Rob Ford impression by demanding that staff remove that rainbow flag, and protesting by hanging a Canadian flag in his office window. Other Canadian cities, including Vancouver, Montreal, and Ottawa, have also made plans to raise Pride flags to mark the opening of the winter Olympics. Ottawa mayor Jim Watson even told off someone on Twitter for opposing the flag. The request to fly the rainbow flag in Toronto came from the 519 Church Street Community Centre, reports CP24, and was approved via the standard protocol process for considering such requests. Ford’s chief of staff, Dan Jacobs, claims the mayor does not want to see the Olympics politicized. There hasn’t yet been any official response to Rob Ford’s demand. UPDATE 2:46 PM: A member of Rob Ford’s executive committee, Anthony Perruzza (Ward 8, York West) has been attempting to negotiate a compromise: flying both the Canadian and rainbow flags. The mayor’s office has confirmed that conversation is underway, but hasn’t clearly said whether Ford supports that alternative. There is one flagpole on the second floor rooftop podium of City Hall, which is used for official flag-raising ceremonies. There is already a Canadian flag flying in Nathan Phillips Square, however, on the street level. This afternoon the 519 Community Centre also released a statement in response to this week’s events. On Friday, Feb. 7 the Chief of Protocol received a request for the raising of the rainbow flag at City Hall from Feb. 7 to Feb. 23. Attached is the request from The 519 which outlines the rationale for the request. In accordance with Council approved “Official Flag for the City of Toronto” report, the Chief of Protocol has delegated authority to approve the flag raising on the courtesy flag pole, requested by the non-profit or charitable organization. 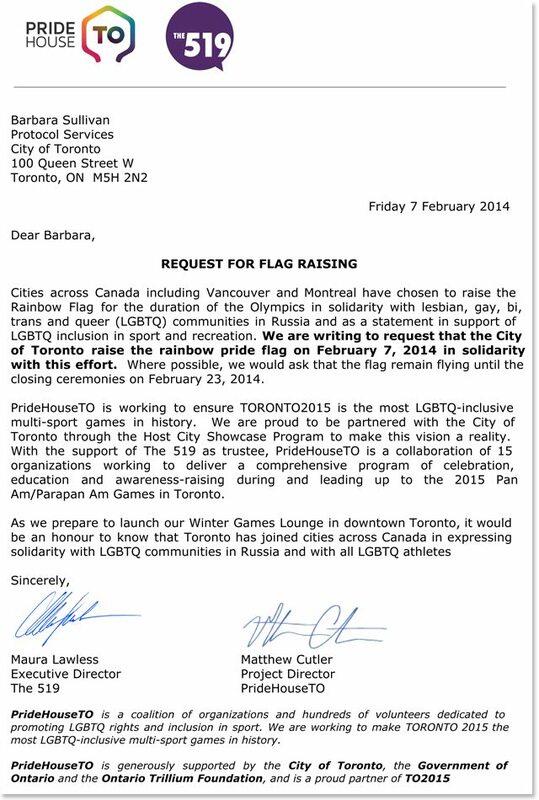 Given that the requirements were met, the Chief of Protocol replaced the Toronto flag with the rainbow flag as requested.